Considering buying the "Survive the End Days" package or wondering if the 2017 doomsday prophecy theory it uses could be true? Find out the truth about the author "Nathan Shephard" and the many errors in how it uses Bible prophecy to predict WWIII during President Obama’s last years. Update for "Alive After the Fall"
In July, 2015, people started emailing me about a new video called Alive After the Fall. As soon as I hit the page, I noticed the similarities with Survive the End Days. The pages are both using similar video and text sales copy about how Russia will attack America with an electromagnetic pulse as foretold in Bible prophecy to create a need for their ebook on how to survive in America. Therefore the points in this review on Survive the End Days apply just the same to Alive After the Fall, such as Bible prophecy telling God's plan is for all his people to come out of America, not stay behind. Read on to understand more on why the ebook is giving very bad advice you don't need to pay for. Yes, This Is a Real Review of "Survive the End Days"
Congratulations, you've found an actual unbiased review of Survive the End Days (and Alive After the Fall). I hasten to say this because, as you may know, when you google "Survive the End Days Review" or "Alive After the Fall" all you find are dozens of affiliate pages with fake reviews. These pages try to appear fair and unbiased, but they always recommend the product and always include an affiliate link to the order page that gives the reviewer a kickback (commission) for every buyer they send. Why Did I Write This Review? As with all my articles, this page came about after enough people emailed me asking me the same question. In this case the question was, "Have you seen the Survive the End Days/Alive After the Fall video and what do I think of it?" When I finally had time to sit down and watch the 42 minute video, I could see immediately that it was the work of an expert online marketer. Who, I could not tell, because he hides behind a pseudonym of "Nathan Shephard." A few minutes in, I began to hear statements that made me doubt that the author was a "fervent Christian ever since I was a child" who has "dedicated my life to studying the ancient Scriptures" as was claimed. By the end of the video, I was laughing at the huge mistakes the author of Survive the End Days made in what he said. He said things that a real Bible-reading (or even just church-attending) Christian would never say! I'll show you why later, and I think you'll laugh, too. For sure, as a Christian you won't trust the author enough to buy his product. I have the full video linked below, but to save you wasting your time watching it, I'll first summarize the video and its premise. 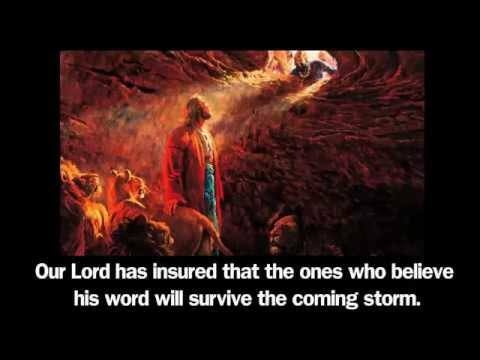 The video starts out provocatively suggesting there is a conspiracy by Obama and church leaders to keep you from knowing what Bible prophecy says. This is effective since Obama is generally disliked by conservative Christians and it is easy for them to believe he is engaged in evil like this. Does it not seem odd to you that America, the greatest nation on Earth, the greatest evangelical nation, the richest and the most powerful country today IS NOT EVEN MENTIONED IN THE BIBLE? The author has done his homework and presents some of the same proofs that I do in my book to show that America is Mystery Babylon. It's really a great start to the video as he's teaching rare truth that indeed "the church does not teach." This alone explains why so many people have watched the video and shared it with others. It's truth. Naturally, it goes downhill from there when the author tries to argue that Barack Obama and Vladimir Putin are in Bible prophecy as the King of the South (Obama) and King of the North (Putin), respectively. The proof? Russia (where Putin was born) is north of Jerusalem and Hawaii (or Kenya!) where Obama was born is south of Jerusalem. Ha! Yes, Hawaii is South of Jerusalem. Then the author asserts that Putin will defeat Obama's America by using an Electromagnetic Pulse (EMP) weapon. This is a nuclear device that discharges energy in a way that it fries any unprotected electronics. Who will survive this attack on the US? The Amish will! They already live off the grid, literally. They prep with the best of them. They store food and medicine without refrigeration and know how to keep water fresh. The author has lived among them for two years and learned their secrets. He then offers his prepping/survival ebook for patriots and Christians that spills all you need to know to get past the EMP that is sure to come before Obama leaves office January, 2017. He promises to "show you how to assemble a Faraday cage by using common parts lying around in your kitchen in just 10 minutes of your time." Perhaps you can already see, the premise is deeply flawed on several levels. First the interpretation of prophecy is speculative and unfounded. While it offers convincing proof that America is Mystery Babylon, it never proves Obama or Putin are in Bible prophecy. I mean, come on, in what universe is Hawaii "south of Jerusalem"? Further you still have the problem that the King of the North of Daniel 11:36-45 is plainly the Antichrist. According to Daniel 9:26, the Antichrist must be a ruler based in the old Roman Empire. But Russia was never part of the Roman Empire. This means Putin could never be the Antichrist or the King of the North. But the author won't let the facts get in the way of a good story like Obama being in prophecy as the president during WWIII. This assertion creates the urgency needed (Obama leaves office in 2017) to counteract the apathy most prospects have. Another fact of prophecy that the author ignores is that it tells us many times no one will survive America's fall or live in the country after it is destroyed by fire (Jer 50:40; 51:43; Rev 18:8,21-24). That's why the plan of God in the Bible is not for people to prep and stay, but to direct them to "come out of her my people" (Rev 18:4). To help us literally move out as my article on America Mystery Babylon Great explains. Finally, if America were going to fall in the next two years, we would already be hearing warnings about this (Jer 50:46) so that all of us could know to "come out of her my people." Let's understand that God is not saving only prepping and survivalist Christians. He has a plan to save us all or a tiny fraction of "his people" would make it. It's common for even dedicated Christians to misunderstand prophecy. That's normal and it does not mean the author is not a Christian. However, as you watch the video, you'll notice for someone claiming to be a lifelong Christian, the terms and language he uses do not sound quite right. It's like he's never stepped a foot inside a church. There is no "the prophet Matthew" in the Bible. The apostle Matthew is the author of the Gospel of Matthew. 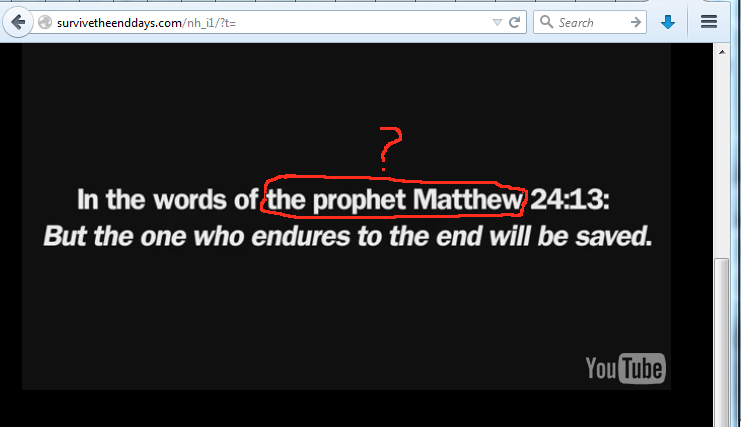 The words recorded in Matthew 24:13 are not of "the prophet Matthew" or even the apostle Matthew. They are of course the words of Jesus! OK, so he's clearly lied about being a Christian and a student of the Bible. But maybe he did live among the Amish and can tell you how to live off the grid like them? Maybe his book has true value in the area of prepping and survivalism? OK but even if we don't hold his misrepresentations against him and we also ignore the prophecy about there being no survivors in America after its destruction, a book on prepping and survivalism is going to do you no good in the end times. Prepping and learning survival skills is indeed helpful for normal power outages, tornadoes, earthquakes, tsunamis, droughts, famines. But the end times wont bring just one or two of those problems or in a limited area. It will bring all those problems at once and everywhere at once. Revelation 6-8 talk about the planet Wormwood coming and devastating the earth with a great global earthquake (6th seal), meteorites burning one third of the earth and all the grass and creating global famine (1st trumpet), asteroids creating tsunamis (2nd trumpet), fresh waters being poisoned (3rd trumpet) and a great darkness and cold (more famine) (4th trumpet). There is no way to prep enough for the end of the world like Wormwood will bring. And even if you could or did, everyone else who has not prepped will take what you have from you. People become animals when they are hungry and desperate. They will be willing to attack and kill you to have everything you have stored up. It's naive to think you will be able to prep and live somewhere that desperate roving bands of evil looters will not eventually find you and kill you. That's why prepping and survivalism is not going to save you from the end times. Choosing God's Survival Plan Instead. A book offering to teach you survivalism to escape prophesied end time events is a complete waste of money. Besides, you already have the survival book of the end times. It tells you to "pray always that you may have the strength to escape all these things and stand before the Son of Man" (Lk 21:36). If you do this diligently, you will take part in the end time escape plan from WWIII, Wormwood and the Great Tribulation that God already has planned. If you need help understanding what the Bible says on all this, my book Know the Future (and other articles on this site) can explain it to you literally, in a way that you can verify it for yourself in your own Bible.